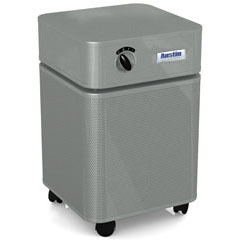 The HM400 is one of the best portable air purifiers on the market today. This unit will improve air quality dramatically in the home andor the office. 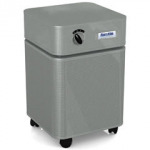 The HM400 uses a HEPA filter that also uses charcoal and zeolite (these two materials help eliminate odors). Operating between 20 decibels (low setting) to 65 decibels (high setting) the HM400 performs virtually unnoticed. Energy consumption cost about one cent per hour with the maximum draw of about 90 watts (set on high). The HM400 can clean an average bedroom in about 15 minutes with the door closed. It is rated to clean 1,500 square feet. Dimensions are 23″ x 14.5″ x 14.5″. The unit carries a five year guarantee for the motor, fan, and other working parts.